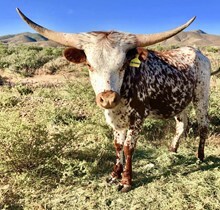 Starr is a FANCY black and white TLBAA registered Texas Longhorn who has produced two fantastic heifer calves, and who was an excellent mother to each. Starr is a perfectly proportioned FANCY black and white spotted and frosted cow who has produced two FANCY heifers, red/white (2/21/2017) Hollywood Starlet (CER RJ Admiral Rattler x WO Shooting Starr), and (5/16/2018) CER Shooting Starrburst (CER RJ Admiral Rattler x WO Shooting Starr). WO Shooting Starr is a black/white lovely 2014 daughter of Rough N Tumble x WO Belle Starr who brings lots of color to our herd. 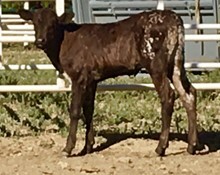 Starr’s first calf (2/21/2017) is a walking work of art is aptly named CER Hollywood Starlet (Max HB x WO Shooting Starr) for her ready for camera movie star markings! Starlet’s horn growth has been incredible and we are excited to see what she produces for us in the near future as she has been exposed to CER RJ Admiral Rattler, a known producer of crazy color! Starr brought us another fabulous heifer calf on 5/16/2018! CER Shooting Starrburst (CER RJ Admiral Rattler x WO Shooting Star). Starburst is a mini me of her mother, a beautiful black bodied heifer with frosted hips who brings a wonderful pedigree to our program! Starr is a good mother with a shiny coat and healthy babies. 3 in 1 package $2,000.